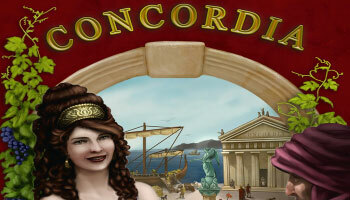 Concordia is a strategic deck-building game in Roman times similar to Dominion. The game isn not luck based since all players start with the same deck of 8 cards and can acquire more cards they want. Every turn, you play a card from your deck and execute its action. The actions expand a player's empire around the map. The available cards and actions are: architect, prefect, colonist, mercator, consul, senator, diplomat, specialists and tribune. The game ends after the last card has been bought or when a player places his last house. The number and type of cards each player ends the game with are used to determine their final score and the player with the most points is the winner.